For the 2015 film, see Backgammon (film). For the jazz album, see Backgammon (album). Backgammon is one of the oldest known board games. Its history can be traced back nearly 5,000 years to archeological discoveries in Mesopotamia. It is a two player game where each player has fifteen pieces (checkers) which move between twenty-four triangles (points) according to the roll of two dice. The objective of the game is to be first to bear off, i.e. move all fifteen checkers off the board. Backgammon is a member of the tables family, one of the oldest classes of board games. Each side of the board has a track of 12 long triangles, called points. The points form a continuous track in the shape of a horseshoe, and are numbered from 1 to 24. In the most commonly used setup, each player begins with fifteen chips, two are placed on their 24-point, three on their 8-point, and five each on their 13-point and their 6-point. The two players move their chips in opposing directions, from the 24-point towards the 1-point. To start the game, each player rolls one die, and the player with the higher number moves first using the numbers shown on both dice. If the players roll the same number, they must roll again. Both dice must land completely flat on the right-hand side of the gameboard. The players then take alternate turns, rolling two dice at the beginning of each turn. When all of a player's checkers are in that player's home board, that player may start removing them; this is called "bearing off". A roll of 1 may be used to bear off a checker from the 1-point, a 2 from the 2-point, and so on. If all of a player's checkers are on points lower than the number showing on a particular die, the player may use that die to bear off one checker from the highest occupied point. For example, if a player rolls a 6 and a 5, but has no checkers on the 6-point and two on the 5-point, then the 6 and the 5 must be used to bear off the two checkers from the 5-point. When bearing off, a player may also move a lower die roll before the higher even if that means the full value of the higher die is not fully utilized. For example, if a player has exactly one checker remaining on the 6-point, and rolls a 6 and a 1, the player may move the 6-point checker one place to the 5-point with the lower die roll of 1, and then bear that checker off the 5-point using the die roll of 6; this is sometimes useful tactically. As before, if there is a way to use all moves showing on the dice, by moving checkers within the home board or bearing them off, the player must do so. If a player's checker is hit while in the process of bearing off, that player may not bear off any others until it has been re-entered into the game and moved into his/her home board, according to the normal movement rules. The first player to bear off all fifteen of his/her own checkers wins the game. If the opponent has not yet borne off any checkers when the game ends, the winner scores a gammon, which counts for double stakes. If the opponent has not yet borne off any checkers and has some on the bar or in the winner's home board, the winner scores a backgammon, which counts for triple stakes. Whenever a player accepts doubled stakes, the cube is placed on their side of the board with the corresponding power of two facing upward, to indicate that the right to re-double belongs exclusively to the player who last accepted a double. If the opponent drops the doubled stakes, he or she loses the game at the current value of the doubling cube. For instance, if the cube showed the number 2 and a player wanted to redouble the stakes to put it at 4, the opponent choosing to drop the redouble would lose two, or twice the original stake. There is no limit on the number of redoubles. Although 64 is the highest number depicted on the doubling cube, the stakes may rise to 128, 256, and so on. In money games, a player is often permitted to "beaver" when offered the cube, doubling the value of the game again, while retaining possession of the cube. A variant of the doubling cube "beaver" is the "raccoon". Players who doubled their opponent, seeing the opponent beaver the cube, may in turn then double the stakes once again ("raccoon") as part of that cube phase before any dice are rolled. The opponent retains the doubling cube. E.g. White doubles Black to 2 points, Black accepts then beavers the cube to 4 points; White, confident of a win, raccoons the cube to 8 points, while Black retains the cube. Such a move adds greatly to the risk of having to face the doubling cube coming back at 8 times its original value when first doubling the opponent (offered at 2 points, counter offered at 16 points) should the luck of the dice change. Some players may opt to invoke The Murphy rule or the "automatic double rule". If both opponents roll the same opening number, the doubling cube is incremented on each occasion yet remains in the middle of the board, available to either player. The Murphy rule may be invoked with a maximum number of automatic doubles allowed and that limit is agreed to prior to a game or match commencing. When a player decides to double the opponent, the value is then a double of whatever face value is shown (e.g. if two automatic doubles have occurred putting the cube up to 4, the first in-game double will be for 8 points). The Murphy rule is not an official rule in backgammon and is rarely, if ever, seen in use at officially sanctioned tournaments. 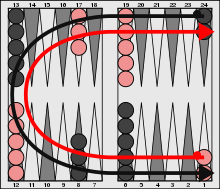 There are many variants of standard backgammon rules. Some are played primarily throughout one geographic region, and others add new tactical elements to the game. Variants commonly alter the starting position, restrict certain moves, or assign special value to certain dice rolls, but in some geographic regions even the rules and directions of the checkers' movement change, rendering the game fundamentally different. Nərd is a traditional variant from Azerbaijan in which basic rules are almost the same except that even a single piece is 'safe'. There are also different starting positions. Nackgammon is a variant of backgammon invented by Nick "Nack" Ballard in which players start with one less checker on the six point and midpoint and two checkers on the 23 point. Russian backgammon is a variant described in 1895 as: "...much in vogue in Russia, Germany, and other parts of the Continent...". Players start with no checkers on the board, and both players move in the same direction to bear off in a common home board. 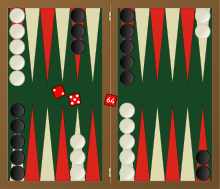 In this variant, doubles are more powerful: four moves are played as in standard backgammon, followed by four moves according to the difference of the dice value from 7, and then the player has another turn (with the caveat that the turn ends if any portion of it cannot be completed). Plakoto, Fevga and Portes are three versions of backgammon played in Greece. Together, the three are referred to as Tavli.Misere (Backgammon to Lose) is a variant of backgammon in which the objective is to lose the game. Other minor variants to the standard game are common among casual players in certain regions. For instance, only allowing a maximum of five checkers on any point (Britain) or disallowing "hit-and-run" in your home board (Middle East). Many positions require a measurement of a player's standing in the race, for example, in making a doubling cube decision, or in determining whether to run home and begin bearing off. The minimum total of pips needed to move a player's checkers around and off the board is called the "pip count". The difference between the two players' pip counts is frequently used as a measure of the leader's racing advantage. Players often use mental calculation techniques to determine pip counts in live play. Backgammon is played in two principal variations, "Money" and "Match" play. Money play means that every point counts evenly and every game stands alone, whether money is actually being wagered or not. "Match" play means that the players play until one side scores (or exceeds) a certain number of points. The format has a significant effect on strategy. In a match, the objective is not to win the maximum possible number of points, but rather to simply reach the score needed to win the match. For example, a player leading a 9-point match by a score of 7–5 would be very reluctant to turn the doubling cube, as their opponent could take and make a costless redouble to 4, placing the entire outcome of the match on the current game. Conversely, the trailing player would double very aggressively, particularly if s/he has chances to win a gammon in the current game. In money play, the theoretically correct checker play and cube action would never vary based on the score. In 1975, Emmet Keeler and Joel Spencer considered the question of when to double or accept a double using an idealized version of backgammon. In their idealized version, the probability of winning varies randomly over time by Brownian motion, and there are no gammons or backgammons. They showed that the optimal time to offer a double was when the probability of winning reached 80%, and it is wise to accept a double only if the probability of winning is at least 20%. As their assumptions do not correspond perfectly to the real game, actual doubling strategy may vary, but the 80% number still provides a possible rule of thumb. Enthusiasts have formed clubs for social play of backgammon. Local clubs may hold informal gatherings, with members meeting at cafés and bars in the evening to play and converse. A few clubs offer additional services, maintaining their own facilities or offering computer analysis of troublesome plays. Some club leaders have noticed a recent[when?] growth of interest in backgammon, and attribute it to the game's popularity on the Internet. Starting in January 2018, tournament directors began awarding GammonPoints, a free points registry for tournament directors and players, with GammonPoint awards based on the number of players and strength of field. When backgammon is played for money, the most common arrangement is to assign a monetary value to each point, and to play to a certain score, or until either player chooses to stop. The stakes are raised by gammons, backgammons, and use of the doubling cube. Backgammon is sometimes available in casinos. Before the commercialization of artificial neural network programs, proposition bets on specific positions were very common among backgammon players and gamblers. As with most gambling games, successful play requires a combination of luck and skill, as a single dice roll can sometimes significantly change the outcome of the game. Backgammon is widely considered by Islamic scholars to be haram (forbidden) in Islam. The prohibition is based on sayings attributed to the Prophet Muhammad regarding gambling in general and backgammon in particular, such as: "Whoever plays backgammon it is as if he puts his hand in the pork and pigs blood." Grand Ayatollah Ali al-Sistani of Iraq, one of the prominent religious leaders of Shia Muslims, issued multiple fatwas against chess and backgammon ruling that playing both “is absolutely forbidden even without placing a bet”. Backgammon software has been developed not only to play and analyze games, but also to facilitate play between humans over the internet. 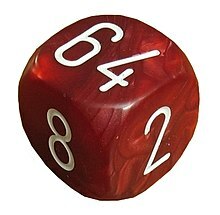 Dice rolls are provided by random or pseudorandom number generators. 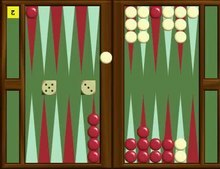 Real-time online play began with the First Internet Backgammon Server in July 1992, but there are now a range of options; many of which are commercial. Remains of a board game from 3000 BC were found at Shahr-e Sukhteh (Persian شهر سوخته) in Iran. 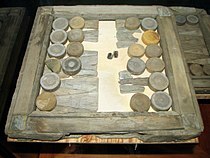 The artifacts included two dice and 60 checkers, and the set is believed to be 100 to 200 years older than the Royal Game of Ur. On the board found in Shahr-e Sukhteh the fields are fashioned by the coils of a snake. Board game artifacts found at Jiroft, from about 2000 BC, may represent a game that is more closely related to modern backgammon than those found at Shahr-e Sukhteh and Ur. The game of backgammon is first mentioned in Bhartrhari’s Vairagyasataka (p. 39), composed around the late 6th or early 7th century AD. The use of dice for the game is another indication of its Indic origin, since dice and gambling were a favorite pastime in ancient India. The rules of the game, however, first appeared in the Middle Persian text Wızarisnı Catrang ud Nihisnı New Ardaxsır (Explanation of Chess and Invention of Backgammon), composed in the 6th century during the rule of the Sasanian king Khosrow I (530–571). The text assigns its invention to the Persian sage Wuzurgmihr (Persian) Buzarjumihr/Bozorgmehr, who was the minister of King Khosrow I. According to the historical legend, the Indian king Dewisarm sends his minister Taxritos to Persia with the game of chess, and a letter challenging Sasanian King Khosrow I to solve the riddle or rationale for the game. Khosrow asks for three days to decipher the game, but initially no-one in the court is able to make any progress. On the third day, Khosrow's minister, Wuzurgmihr, successfully rises and explains the logic of the game. As a reciprocal challenge, Wuzurgmihr constructs the game of backgammon and delivers it to the Indian king who is unable to decipher the game. In the 11th century Shahnameh, the Persian poet Ferdowsi credits Burzoe with the invention of the tables game nard in the 6th century. He describes an encounter between Burzoe and a Raja visiting from India. The Raja introduces the game of chess, and Burzoe demonstrates nard, played with dice made from ivory and teak. Today, Nard is the name for the Persian version of backgammon, which has different initial positions and objectives. H. J. R. Murray details many versions of backgammon; modern Nard is noted there as being the same as backgammon and maybe dating back to 300–500 AD in the Babylonian Talmud, although others believe the Talmud references the Greek race game Kubeia. The history of backgammon can be traced back nearly 5,000 years to its origins in Mesopotamia (modern-day Iraq). Excavations in Iraq have shown that a board race game existed there around 5000 BC. The world's oldest set of dice (made from human bone) were recently discovered in that part of the world. Modern Iraqis continue to enjoy playing the game. The Royal Game of Ur, originating in ancient Mesopotamia before 2600 BC, may also be an ancestor of modern-day table games like backgammon. It used tetrahedral dice. In the modern Middle East, backgammon is a common feature of coffeehouses. Race board games involving dice have a long history in Iraq, including the Royal Game of Ur in Babylon. Today the game is commonly played in Iraq, Lebanon, Egypt, Syria, Jordan, and other Arab countries. In the (modern) Arab Levant and Iraq it is called tawle which means table, and it is also called shesh besh (shesh means 6 in Aramaic and Phoenician, but derives from Phoenician. However, shesh also means 6 in Persian and 5 is likely to be closely related to "Penj" meaning 5. Shesh Besh is commonly referred to the situation when a player scores a 5 and 6 at the same time on dice). Short nardi: Set-up and rules the same as backgammon. Long nardi: A game which starts with all fifteen checkers placed in one line-on 24-point and on 11-point. The two players move their checkers in opposing directions, from the 24-point towards the 1-point, or home board. In long nardi one checker by itself can block a point. There is no hitting in long nardi. The objective of the game is bearing all checkers off the board. There is no doubling cube. Tάβλη (tavli) meaning "table" or "board" in Byzantine Greek, is the oldest game with rules known to be nearly identical to backgammon; it is described in an epigram of Byzantine Emperor Zeno (AD 476–491). The board was the same with 24 points, 12 on each side. As today, each player had 15 checkers and used cubical dice with sides numbered one to six. The object of the game, to be the first to bear off all of one's checkers, was also the same. Hitting a blot, reentering a piece from the bar, and bearing off, all followed the modern rules. The only differences with modern backgammon were the use of an extra die (three rather than two) and the starting of all pieces off the board (with them entering in the same way that pieces on the bar enter in modern backgammon). The name τάβλη is still used for backgammon in Greece, where it is frequently played in town plateias and cafes. The epigram of Zeno describes a particularly bad dice roll the emperor had for his given position. Zeno, who was white, had a stack of seven checkers, three stacks of two checkers and two blots, checkers that stand alone on a point and are therefore in danger of being put outside the board by an incoming opponent checker. Zeno threw the three dice with which the game was played and obtained 2, 5 and 6. As in backgammon, Zeno could not move to a space occupied by two opponent (black) pieces. The white and black checkers were so distributed on the points that the only way to use all of the three results, as required by the game rules, was to break the three stacks of two checkers into blots, exposing them and ruining the game for Zeno. 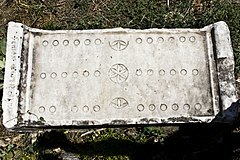 The τάβλη of Zeno's time is believed to be a direct descendant of the earlier Roman Ludus duodecim scriptorum ("Game of twelve lines") with that board's middle row of points removed, and only the two outer rows remaining. Ludus duodecim scriptorum used a board with three rows of 12 points each with the 15 checkers being moved in opposing directions by the two players across three rows according to the roll of the three cubical dice. Little specific text about the gameplay of Ludus duodecim scriptorum has survived; it may have been related to the older Ancient Greek dice game Kubeia. The earliest known mention of the game is in Ovid's Ars Amatoria (The Art of Love) (written between 1 BC and 8 AD). In Roman times this game was also known as alea, and a likely apocryphal Latin story linked this name, and the game, to a Trojan soldier named Alea. Race board games involving dice have existed for millennia in the Near East and eastern Mediterranean, including the game senet of Ancient Egypt. 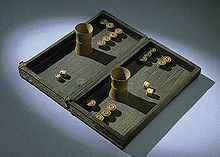 The ancient Egyptian game senet was excavated, along with illustrations, from Egyptian royal tombs dating to 3500 BC. Though using a board that is quite different from backgammon, it may be a predecessor. Backgammon, which is known as "tavla", from Byzantine Greek τάβλη, is a very popular game in Turkey, and it is customary to name the dice rolls with their Persian number names, with local spellings: yek (1), dü (2), se (3), cehar (4), penç (5), şeş (6). The usual Tavla rules are same as in the neighboring Arab countries and Greece, as established over a millennium ago, but there are also many quite different variants. The usual tavla is also known as erkek tavlası meaning boys' or men's tavla. The other variant kız tavlası (i.e. girls' tavla) is a game that depends only on the dice and involves no strategy. Another variant, asker tavlası (meaning soldiers' tavla), has the pieces thrown to the board randomly and the opponents try to flip their pieces over the opponents' pieces to beat them. Asodio: Also known as Acey-deucey where all checkers are off the board, and you enter by rolling either doubles or acey-deucey. Backgammon was popular in China for a time and was known as "shuanglu" (双陆), with the book Pǔ Shuāng (譜雙) written during the Southern Song (1127–1279) period recording over ten variants - but over time it was replaced by other games such as xiangqi (Chinese chess). In Japan ban-sugoroku is thought to have been introduced from China in the 6th century. As a gambling game it was made illegal several times. In the early Edo-era, a new and quick gambling game called Chō-han appeared and sugoroku quickly dwindled. By the 13th century, the board game Go, originally played only by the aristocracy, had become popular among the general public. In Korea, it is called Ssang-ryuk or Jeopo. 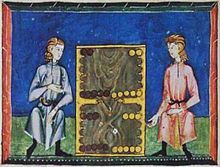 The jeux de tables (Games of Tables), predecessors of modern backgammon, first appeared in France during the 11th century and became a favorite pastime of gamblers. In 1254, Louis IX issued a decree prohibiting his court officials and subjects from playing. Tables games were played in Germany in the 12th century, and had reached Iceland by the 13th century. 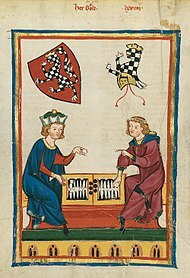 In Spain, the Alfonso X manuscript Libro de los juegos, completed in 1283, describes rules for a number of dice and table games in addition to its extensive discussion of chess. By the 17th century, table games had spread to Sweden. A wooden board and checkers were recovered from the wreck of the Vasa among the belongings of the ship's officers. Backgammon appears widely in paintings of this period, mainly those of Dutch and German painters (Van Ostade, Jan Steen, Hieronymus Bosch, Bruegel and others). Some surviving artworks are "Cardsharps" by Caravaggio (the backgammon board is in the lower left) and "The Triumph of Death" by Pieter Bruegel the Elder (the backgammon board is in the lower right). Others are the Hell of Bosch and interior of an Inn by Jan Steen. In the 16th century, Elizabethan laws and church regulations prohibited playing tables, but by the 18th century, backgammon was popular among the English clergy. 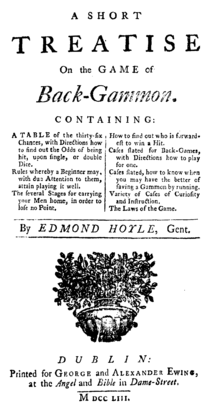 Edmund Hoyle published A Short Treatise on the Game of Back-Gammon in 1753; this described rules and strategy for the game and was bound together with a similar text on whist. ^ a b Wilkinson, Charles K (May 1943). "Chessmen and Chess". The Metropolitan Museum of Art Bulletin. New Series 1 (9): 271–279. doi:10.2307/3257111. JSTOR 3257111. ^ a b c d e Murray, H. J. R. (1952). "6: Race-Games". A History of Board-Games Other than Chess. Hacker Art Books. ISBN 978-0-87817-211-5. ^ a b Chris Bray (14 February 2011). Backgammon For Dummies. John Wiley & Sons. pp. 31–. ISBN 978-1-119-99674-3. ^ a b Chris Bray (2012). Backgammon to Win. Lulu Com. pp. 6–. ISBN 978-1-291-01965-0. ^ Chris Bray. Backgammon For Dummies. p. 23. ^ Nicolae Sfetcu. Gaming Guide - Gambling in Europe. p. 39. ^ a b c d e f g h i j k l Robertie, Bill (2002). Backgammon for Winners (Third ed.). Cardoza. ISBN 978-1-58042-043-3. ^ Robertie, Bill. "Backgammon Beavers". GammonVillage. Retrieved 2007-10-17. ^ a b Robertie, Bill (2006). Backgammon for Serious Players (Second ed.). Cardoza. pp. 19–22. ISBN 978-0-940685-68-0. ^ "Backgammon Glossary/Holland Rule". Bkgm.com. Retrieved 2009-02-26. ^ a b Tesauro, G. (2002). "Programming backgammon using self-teaching neural nets" (PDF). Artificial Intelligence. 134 (1): 181–199. doi:10.1016/S0004-3702(01)00110-2. Archived from the original (PDF) on 2007-09-27. Retrieved 2007-08-08. ^ a b Strato, Michael. "Backgammon Variants". Gammonlife. Archived from the original on 13 September 2007. Retrieved 2007-08-08. ^ Thompson, Mark. "Nackgammon". mindfun. Archived from the original on 2008-10-09. Retrieved 2009-02-04. ^ Woolsey, Kit (September 2001). "Nackgammon". Gammonline. Archived from the original on 2007-09-28. Retrieved 2007-08-08. ^ "Russian Backgammon". Bkgm.com. Archived from the original on 13 March 2009. Retrieved 2009-02-26. ^ "Backgammon FAQ: Basic Rules". ^ "Backgammon Rules – And How To Play". ^ a b c d e f g h Magriel, Paul (1976). Backgammon. Quadrangle/The New York Times Book Co. ISBN 978-0-8129-0615-8. ^ Keeler, Emmet; Spencer, Joel (1975). "Optimal Doubling in Backgammon". Operations Research. 23 (6): 1063–1071. doi:10.1287/opre.23.6.1063. ^ a b Bray, Chris (2008). Backgammon for Dummies. John Wiley & Sons. p. 13 and 224. ISBN 978-0-470-69456-5. ^ Harrington Green, Jonathan (1845). An exposure of the arts and miseries of gambling. Redding. p. 203. ^ "Tribes of Sydney—Sydney Backgammon Club". The Daily Telegraph (Australia). June 24, 2006. p. 95. ^ Bray, Chris (June 29, 2002). "Backgammon". The Independent (London). p. 50. ^ Bray, Chris (November 25, 2000). "Backgammon". The Independent (London). p. 19. ^ Laverty, Roy (May 16, 2003). "Backgammon warriors—columnist, club member square off as board game's popularity grows". Alameda Times-Star (Section: Bay Area Living). ^ Magriel, Paul (June 1, 1980). "Backgammon: Before Planning Big Attack, Be Sure to Cover Your Rear". The New York Times, Late City Final Edition. pp. 50, section 1, part 2. ^ a b Maxa, Rudy (September 6, 1981). "Where the Rich And the Royal Play Their Games—Monte Carlo's Seven-Day Backgammon Soiree With Countesses, Princes and Other Sharpies". The Washington Post. p. H1. ^ "GammonPoints". www.gammonpoints.com. Retrieved 2018-03-26. ^ Michael Crane (July 25, 2000). "Backgammon News—World Championships 2000". Mind Sports Worldwide. Archived from the original on 7 September 2006. Retrieved 2006-09-14. ^ "PartyGammon.com to Stage First Ever US$1 Million Backgammon Tournament". PR Newswire. Lexis-Nexis. July 10, 2006. ^ "World Backgammon Association". www.world-backgammon-association.com. ^ "Question & Answer; Chess & Backgammon". Sistani.org. Retrieved 1 April 2019. ^ Schneider, Andreas; et al. "Brief history of FIBS". FIBS, the First Internet Backgammon Server. Archived from the original on 2006-08-13. Retrieved 2006-08-05. ^ Schneider, Andreas. " "Backgammon server available NOW". Retrieved 2012-02-11. ^ Keith, Tom. "Backgammon Play Sites". Backgammon galore!. Retrieved 6 March 2017. ^ a b c Tesauro, Gerald (March 1995). "Temporal difference learning and TD-Gammon". Communications of the ACM. 38 (3): 58–68. doi:10.1145/203330.203343. ^ "Backgammon software - Backgammon Online Guide". www.backgammon.help. Archived from the original on 2015-08-16. Retrieved 2015-08-10. ^ "BackgammonSnowie - World class poker coaching software". www.bgsnowie.com. ^ "BGBlitz". BGBlitz. Archived from the original on 25 February 2009. Retrieved 2009-02-26. ^ "World's Oldest Backgammon Discovered In Burnt City". Payvand News. December 4, 2004. Retrieved 2010-05-07. ^ a b Schädler, Ulrich; Dunn-Vaturi, Anne-Elizabeth. "BOARD GAMES in pre-Islamic Persia". Encyclopædia Iranica. Retrieved 2018-04-11. ^ "Backgammon, or Takheth Nard". ^ Leland Graham; Isabelle McCoy (28 August 2008). A New Trip Around the World, Grades K - 5: Activities Across the Curriculum for Cuba, the United Kingdom, Afghanistan, Chile, Iraq, Puerto Rico, Ghana, Morocco, Norway, Guatemala, Spain, and Peru. Carson-Dellosa Publishing. pp. 85–. ISBN 978-1-60418-594-2. ^ Marijean Boueri; Jill Boutros; Joanne Sayad (April 2006). Lebanon A to Z: A Middle Eastern Mosaic. PublishingWorks. pp. 59–. ISBN 978-0-9744803-4-3. ^ a b c d e f g h i Austin, Roland G (1934). "Zeno's Game of τάβλη". The Journal of Hellenic Studies. 54 (2): 202–205. doi:10.2307/626864. JSTOR 626864. ^ a b c Austin, Roland G. (February 1935). "Roman Board Games. II". Greece & Rome. 4 (11): 76–82. doi:10.1017/s0017383500003119. ^ a b Robert Charles Bell, Board and table games from many civilizations, Courier Dover Publications, 1979, ISBN 0-486-23855-5, pp. 33–35. ^ a b Koukoules, Phaidon (1948). Vyzantinon Vios kai Politismos. 1. Collection de l'institut français d'Athènes. pp. 200–204. ^ Austin, Roland G. (October 1934). "Roman Board Games. I". Greece & Rome. 4 (10): 24–34. doi:10.1017/s0017383500002941. ^ Jacoby, Oswald, and John R. Crawford. The backgammon book. Viking Pr, 1976. ^ Hayes, William C. (March 1946). "Egyptian Tomb Reliefs of the Old Kingdom". The Metropolitan Museum of Art Bulletin. New Series 4 (7): 170–178. ^ ERGIL, LEYLA YVONNE. "Top Tavla tips for expats to play like a Turk". Daily Sabah. dailysabah.com. Retrieved 1 February 2017. ^ "backgammon". Internet, Second Edition. 2003. Archived from the original on 13 August 2006. Retrieved 2006-08-05. ^ Lillich, Meredith Parsons (March 1983). "The Tric-Trac Window of Le Mans". The Art Bulletin. 65 (1): 23–33. doi:10.2307/3050296. JSTOR 3050296. ^ Wollesen, Jens T (1990). "Sub specie ludi...: Text and Images in Alfonso El Sabio's Libro de Acedrex, Dados e Tablas". Zeitschrift für Kunstgeschichte. 53 (3): 277–308. doi:10.2307/1482540. JSTOR 1482540. ^ Allee, Sheila. "A Foregone Conclusion: Fore-Edge Books Are Unique Additions to Ransom Collection". The University of Texas at Austin. Archived from the original on 2006-06-21. Retrieved 2006-08-08. ^ "backgammon". The Oxford English Dictionary, Second Edition. 1989. Retrieved 2006-08-05. ^ a b Robertie, Bill (2002). 501 Essential Backgammon Problems (Second Printing ed.). Cardoza. p. 22. ISBN 978-1-58042-019-8. ^ a b "The Inventor of Doubling in Backgammon". www.gammonlife.com. ^ "The Father Of Modern Backgammon - GammonVillage Magazine". www.gammonvillage.com. ^ Bernard Weintraub (January 13, 1966). "Urge to Play Backgammon Sweeping Men's Clubs". The New York Times. Retrieved 2010-09-10. A disk and dice game that has been played in Middle Eastern streets for thousands of years, in English homes for hundreds of years, and on Bronx stoops for dozens of years has suddenly gripped the bankers and brokers of old-line men's clubs all over town. ^ "World Backgammon Championships History - Backgammon Masters - Backgammon Articles' Categories - Play65™". www.play65.com. "Backgammon" . Encyclopædia Britannica (11th ed.). 1911.